I have been weaning Florence now for 4 months and it’s been such an enjoyable and exciting process. Watching her try new flavours and textures; going from puree to mashed food, then finger food to 3 full meals a day. There is currently nothing she doesn’t like and she has, to date, not reacted to anything, allergen foods or otherwise. I have weaned her at a pace that has worked for both of us and one that has made me feel comfortable. 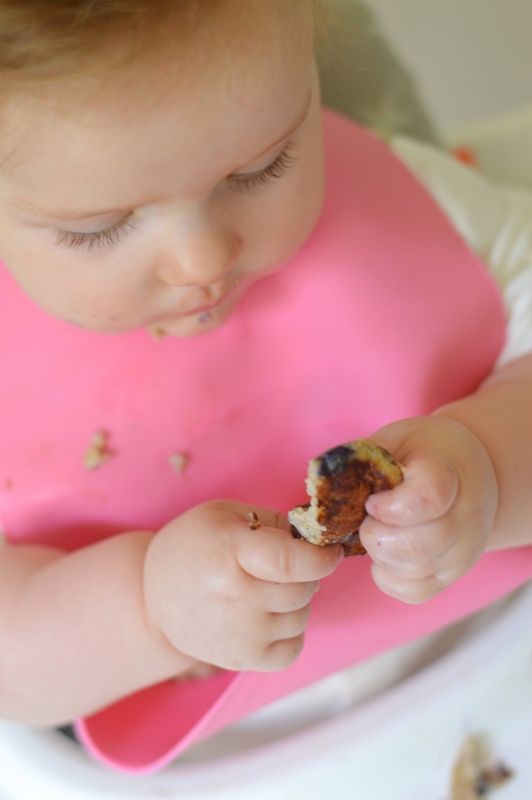 This pancake recipe is one I made up for Florence but quickly realised that not only are they perfect as mini drop pancakes for babies and toddlers but they can be made larger too for children and adults. The ones pictured are mini drop pancakes, they are made with a dessert spoon worth of the batter which I flatten slightly in the pan in to a relatively circular shape. They are absolutely delicious, hold together well, quick to make, easy to hold and more importantly, easy to wipe off the floor. Perfect for picking up and taking on the go, popping in to a lunch box or having at home for breakfast with a little creme fraiche or coconut yoghurt. I usually give Florence a few of these (about 4) for breakfast with a beaker of water and a little greek yoghurt on the side. Most of it will make its way in to her little tum but some will inevitably land on the floor or in my hair. Such is life with a 10 month old! I use a non stick frying pan for all my recipes requiring one. The pan I use means that I don’t even need to use oil or butter which makes a huge amount of difference. It means that things like omelettes and pancakes don’t stick either making for a more enjoyable cooking process. The pan I use I bought from Amazon (here) but you can get it in most high street shops too. If you do not have a non stick frying pan then you will need to ensure you use a generous amount of butter or coconut oil to ensure the mixture does not stick. If you’d like to add any extras then things like orange zest, cinnamon, ginger or good quality dark chocolate would work beautifully. For those who are diabetic or have a diabetic child then each mini pancake (I make 10 out of the batter) is equal to 3.7g carbs. The total carb content for the batter is 37g. If you were to make larger drop pancakes then I’d suggest that the batter would make 4-5. 4 ingredient mini banana and blueberry pancakes. Quick to make, hold together well and taste divine. 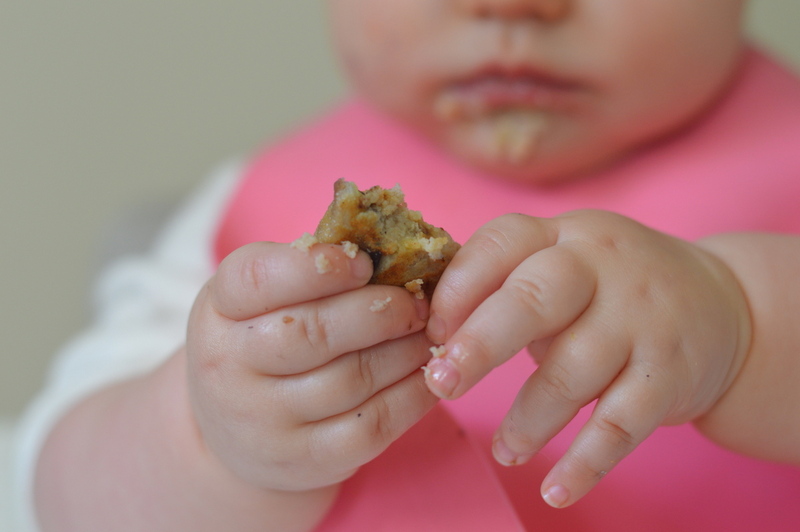 One for the whole family but especially for those weaning their babies. In to a mixing bowl mash the banana into a thick creamy consistency. Add in the blueberries, coconut flour and egg. Mix together well until a thick batter has formed. In to a non stick frying pan over medium - high heat add one knob of butter (or coconut oil), allow to melt (do not let the butter burn though!). I usually make 4 mini pancakes per pan at a time. Reduce the heat to low - medium from now on. Cook until the underside has turned a golden brown and you can easel lift it and carefully flip it over with a spatula. Once flipped cook the other side for 2-3 minutes before removing from the pan and placing on a wire rack to cool a little whilst you finish making the others. You can serve them hot straight from the pan or allow them to cool before putting in a sealed container in the fridge until required. Will keep for up to 4 days. I always recommend using a non stick frying pan, especially those that require no need for oil or butter. It makes the process of making pancakes and omelettes much easier and more enjoyable. If you'd like to add any extras then things like orange zest, cinnamon, ginger or good quality dark chocolate would work beautifully.